We began our story in Part One. North of Port Moresby, the Owen Stanley Mountains run from northwest to southeast along the spine of New Guinea. The mountains are high, up to 13,000 feet, and very rugged with broken terrain on both slopes. The southwestern side (that facing Port Moresby) is even more treacherous than the opposite flank. The mountains are covered by thick jungle, with a heavy canopy that keeps the ground in constant twilight gloom. And the darkness could be deadly for careless soldiers of either side: the ground bore a thick carpet of dead leaves, kept damp by the humidity and therefore squelching the sounds of footsteps. A careful patrol could easily move in silence, hidden by the perpetual shade. The vegetation is broken occasionally by the uniquely Papuan food gardens, small but intensely cultivated zones where sweet potato, banana and taro are grown, usually separated from villages. The weather is hot and extremely humid during the day, alternating with cold nights due to the elevation. Rains are almost constant. The various Papuan tribes who lived in the area had little trade and contact among themselves, and no need for long-distance communication. The track leading north from Port Moresby that became known as the Kokoda Trail probably existed for some time before the first white miners used it in the 1890's to reach gold fields around Kokoda. After German New Guinea passed to Australian control in 1914, the route became a regular path for runners carrying mail between Port Moresby and settlements on the northeastern coast. The Kokoda Trail is difficult going even for individual hikers during peacetime; it's become a pilgrimage site for Australians remembering the Diggers’ sacrifices there in 1942. For organized units, the trek is nearly impossible as motor vehicles can't negotiate the terrain and even pack animals have trouble (and die from the heat when they are inevitably overworked on the steep slopes). In November 1942 a battalion of the American 32nd Infantry Division needed five weeks for an unopposed crossing of the Owen Stanley Range on the parallel Kapa Kapa Trail. Kokoda, the trail’s northern terminus, boasted a rubber plantation, a small government post and the only airfield along the route - one of the few on New Guinea in 1942. From there dirt roads lead to small ports at Buna and Gona (each consisting of no more than a small wharf and a handful of buildings). Infrastructure consisted of a handful of missions and copra plantations, with airstrips at both port villages. The Japanese were not coming as tourists, however, and were determined to seize Port Moresby. Their first effort came in May 1942, but their invasion fleet was turned back at the Battle of the Coral Sea. Before another attempt could be prepared, the Battle of Midway sent four Japanese carriers to the bottom of the Pacific and slowed the pace of the Imperial Navy’s aggression. In August the Navy landed about 2,000 Special Naval Landing Force troops at Milne Bay on the eastern tip of New Guinea, but they were defeated by a much larger Australian garrison including one Imperial Force and one Militia brigade. With the Navy’s effort blunted, it would be up to the Army to take Port Moresby. A mixed force of Army and SNLF troops landed at Gona in late July, stopping long enough to behead Anglican missionaries May Hayman and Mavis Parkinson as well as a six-year-old boy before they started their march on Kokoda. They were quickly met by ambushes from Marouba Force, the small Australian battle group consisting of Militia troops of the 39th Battalion and locally-recruited volunteers of the Papuan Infantry Battalion that was tasked to stop them. The Militia’s 39th Battalion formed in Melbourne in October 1941 from young local conscripts and a draft of men from the Militia’s 2nd Cavalry Division. They shipped out for New Guinea in December with only minimal training, but their superiors had worked hard to improve the unit’s readiness. Maj. Gen. S.H.W.C. Porter, commander of its parent 30th Militia Brigade, had seen considerable action in North Africa and Syria as a battalion commander and had replaced most of the 39th’s officers with veterans of those campaigns. The battalion had also received several drafts of men originally enlisted by the Australian Imperial Force, who greatly resented serving in a “koala” unit but this augmentation gave it higher-quality manpower than might have been expected from a battalion of 18-year-old draftees. The Papuans were all volunteers, many with previous service in the Royal Constanbulary. But they had received cast-off weapons and uniforms; the battalion never reached its authorized strength of 550 Papuan enlisted men and 77 Australian officers and had only three under-strength rifle companies and no heavy weapons. The Papuans were comfortable in the terrain and fought hard against the Japanese, but Australian racial attitudes would soon lead to their re-assignment as unarmed carriers. Australian Maj. Gen. Basil Morris, commander of New Guinea Force, had intended to abandon all of New Guinea northeast of the Owen Stanleys and defend an area close to Port Moresby. The Australians had a good appreciation of the coming Japanese offensive, and Morris reasoned that he could defend close to his own base of operations with well-supplied troops while the Japanese struggled to hand-carry their own supplies over the rugged Kokoda Trail. While that idea had some logic behind it, on Gen. Douglas MacArthur’s situation maps the abandonment of a large swath of ground without resistance made it appear that the Australians lacked the will to fight. MacArthur insinuated just that to his commander of ground forces, the Australian Gen. Sir Thomas Blamey, who ordered Morris to hold Kokoda. Morris in turn informed the troops at Kokoda that “You will engage the enemy,” without any further instructions. The Militia and Papuans did just that. Small groups of Australians put up fierce resistance, making the Japanese pay a heavy toll in casualties to take the village and airstrip at Kokoda. But soon the 39th Battalion was down to 31 officers and 433 men, while the Papuan Infantry Battalion numbered just 8 Australians and 35 Papuans. A small reinforcement did arrive - a contingent of native police accompanied by Angua tribal warriors who had refused to carry supplies but said they were eager to kill Japanese. This small group attacked Kokoda and its vital airstrip in early August, suffering heavy losses. Thanks to support by P-39 fighter planes the Australians managed to take the strip but could not hold it. Both sides suffered heavy losses, and began to feel the effects of food shortages. The Militia battalion fell back to the Isurava area by 14 August, where they dug in using steel helmets and mess tins. Local Papuans hunted down and killed stragglers from the battalion and refugees from European plantations and missions, or handed over the hapless survivors to the Japanese, who usually beheaded them. But reinforcements from 30th Brigade joined the Australians, including the brigade commander. The Japanese attacked and outflanked 53rd (Militia) Battalion using a jungle track left unguarded by the Australians; the battalion commander, Lt. Col. K.H. Ward, was killed and individual soldiers began to slip away from the front line. The way to Port Moresby appeared to be open. The Japanese commander, Col. Yosuke Yokoyama, reported his belief that a large force could pass over the Kokoda Trail to attack Port Moresby. An engineer by trade, Yokoyama had received the assignment specifically so he could make this judgment, and with his assessment in hand Maj. Gen. Tomitaro Horii’s Japanese South Seas Force arrived to make a serious effort to cross the mountains. Horii’s unit, drawn from the 55th Infantry Division, consisted of a strongly reinforced infantry regiment with engineers, dismounted cavalry and artillery. It had fought on Wake Island and had been the ground component of the naval attempt to seize Port Moresby in May. While Australian accounts emphasize the jungle training of the Japanese, the invaders arrived toting useless bicycles which soon littered the road between Gona and Kokoda. On the Australian side, the initial reinforcements consisted of the other two battalions of 30th Militia Brigade, while two brigades of 7th Australian Division landed at Port Moresby and the third at Milne Bay on the island’s eastern tip. But these troops would arrive only slowly, as they had to come overland up the Kokoda Trail and the logistical base to feed and supply thousands of troops did not yet exist on the island. Just why Blamey sent the Militia to New Guinea when the hardened regular brigades were available is not clear, but by the time 7th Division boarded ship for Port Moresby it had undergone five months of intense jungle training in northern Queensland. Desperate to break the Australians before the rest of 7th Division could arrive, Horii launched repeated frontal attacks rather than take the time to feel for the enemy’s flanks. Fighting raged intensely around the clock; the Australian official history records one of the quieter periods as featuring “desultory bayonet fighting during a night of heavy rain.” The Japanese overran many of 2/14’s positions on the 29th before Private Bruce Kingsbury picked that moment to go completely berserk. A sniper shot Kingsbury, who died before Avery could get him to an aid station. But his one-man assault - recognized with a posthumous Victoria Cross - broke the Japanese attack on 2/14 Battalion. Along the front bayonet fighting raged; Corporal C.R. McCallum killed at least 40 Japanese while wielding a sub-machine gun in one hand and a Bren gun in the other until an equally berserk Japanese soldier wrenched the machine gun from his hands. Thanks to dozens of other insane acts of bravery the Australians broke contact and pulled back, while the 32 surviving “ragged bloody heroes” of the 39th as well as the other two Militia battalions staggered back down the Kokoda Trail to Port Moresby. Potts conducted a six-day fighting retreat with his Imperial Force battalions, but could not hold the supply point established at Myola as he lacked the troops to cover several trails passing to the west that would have allowed the Japanese to easily outflank him. His troops were already suffering badly from the harsh climate. Though later Australian tales made much of the heroic “Fuzzy Wuzzy Angels,” the Papuan porters who carried wounded back down the Trail on their backs, some native carriers also were known to unceremoniously toss wounded Diggers into the bush and melt into the jungle if they were not kept under constant observation. Abandoning Myola greatly depressed many Australian officers, as the stockpile of rations built up there at such great effort had to be abandoned. Various sanitized tales speak of the rations being “destroyed” or “contaminated”; it appears that the Australians liberally sprinkled them with human waste. When starving Japanese fell on the heaven-sent food, a mass outbreak of dysentery followed soon afterwards. On 6 September, the Japanese attacked Potts’ new position on Mission Ridge and found an open gap between brigade headquarters and most of his combat elements. Despite commitment of a fresh AIF battalion, hard fighting failed to restore the line, and when night fell the Australians retreated. Two of the surrounded battalions had to break up and filter back as individuals and small groups, causing further losses. Corps headquarters fired Potts and replaced him with Brig. Selwyn Porter, who initiated another retreat. Porter chose the next ridge line, known as Ioribaiwa, to make his stand as it appeared unlikely that the Japanese could outflank the Diggers here. Porter brought along some needed reinforcements, including a company of engineers and a specialized jungle reconnaissance “Independent Company,” and Australian fortunes began to change. 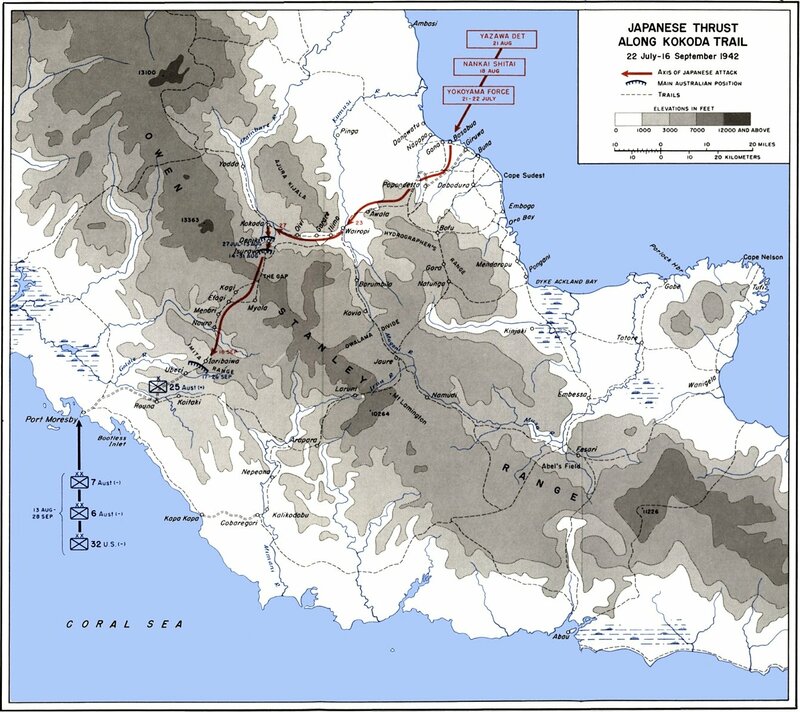 The Japanese could now see the Coral Sea in the far distance, having crested the Owen Stanley Range, but that also put them in the same supply situation the Australians had faced on the opposite side of the mountains - while at the end of a much longer line of communications. The Japanese had to carry all of their supplies by hand, including artillery shells for the single field piece dragged over the mountains. Dysentery, malaria and exhaustion now began to claim hundreds of lives. On the Australian side, the Diggers now enjoyed the advantages seen in Morris’ original plan. A fresh brigade of 6th Australian Division relieved the shattered front-line troops, allowing them to rest and recover. After weeks of effort, sweating Australian gunners even managed to drag a battery of 25-pounder field guns up the steep “golden stair” to provide artillery support along the trail. The air supply situation did not improve much - MacArthur provided a section of six dive bombers for the supply mission - but at least the carriers had a shorter distance to travel and so could carry more per trip since they needed less food for themselves. Port Moresby itself was garrisoned by two of the Militia battalions from 30th Brigade (the 53rd was disarmed and re-assigned to stevedore duty, unloading ships), a fresh Militia brigade and a number of other units including a composite battalion of all the Bren carrier and mortar platoons of Imperial Force battalions sent up the Trail. Our story concludes in Part Three. Fight for Port Moresby! 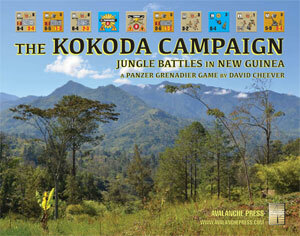 Order The Kokoda Campaign right now. Yes, now!